This low-carb, Italian-inspired dish has so much going for it! It involves lean ground turkey, fresh veggies, and is topped with cheese and toasted bread crumbs. Less guilt but tons of flavor. 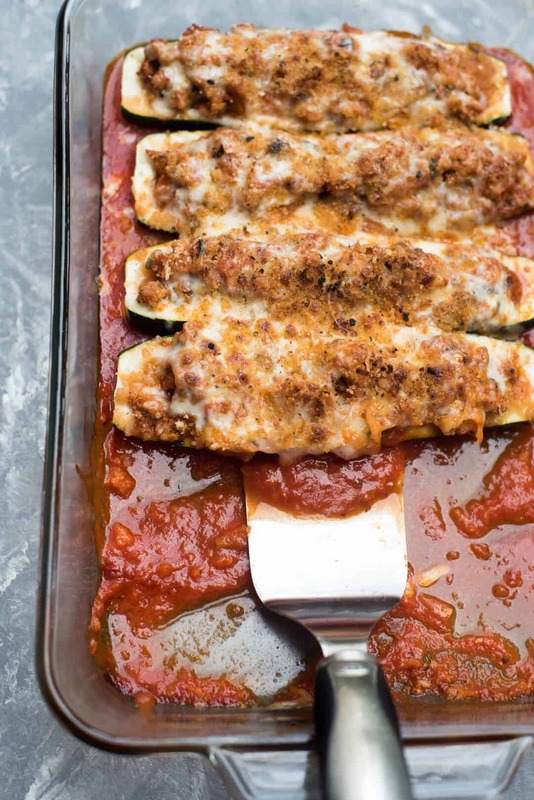 These Italian Stuffed Zucchini Boats have changed my feelings when it comes to Italian food. And, I have some pretty serious feelings on the subject. That’s kind of a big deal, isn’t it? When I crave Italian I immediately think of rigatoni, spaghetti, penne, or how about ravioli in a light tomato cream sauce sprinkled with plenty of fresh basil and shaved Parmesan. I mean, come on! I never thought I could get the same level of serious contentment and satisfaction with a dish that doesn’t involve pasta. 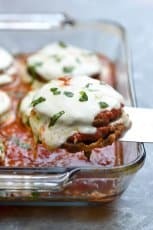 That changed when I tried stuffing zucchini with a delicious mixture of lean ground turkey, onion, garlic, red bell pepper, cremini mushrooms, all simmered with a simple jarred marinara. Okay, so there is cheese on top, but I went with part-skim mozzarella and just enough Parmesan to add a sharp, salty bite. Loaded with nutrition and all in all, pretty darn good for ya! Take a look at the quick how-to video below for my tips on how to cleanly and easily scoop the zucchini and prepare the filling. Another great aspect of this recipe – there’s really no need to prepare a separate veggie side dish. By all means, you can, but this dish is a vegetable and entree all in one. Add a simple side like rice and a glass of big, bold red wine and I’m a happy girl. 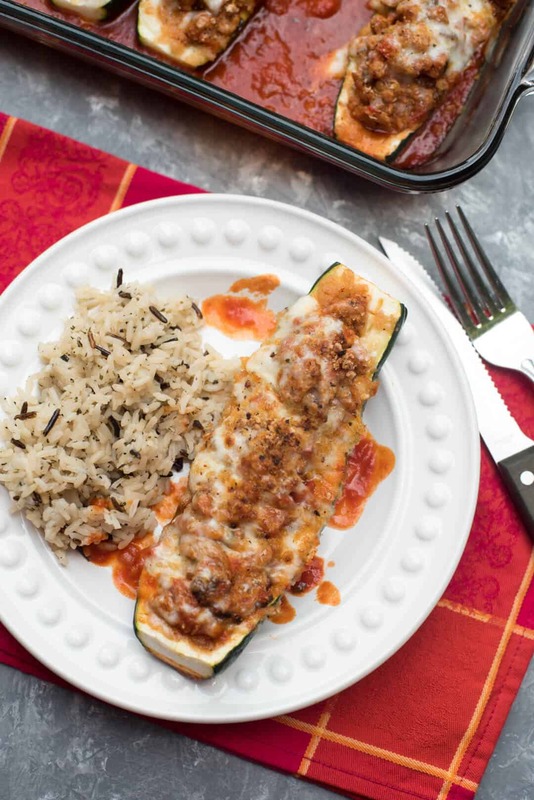 If you like these, you’re going to love my Taco Stuffed Zucchini Boats! Preheat oven to 375 degrees F. Measure out 1 cup of the marinara sauce and set aside. Trim ends from zucchini and slice in half, lengthwise. Use the tip of a spoon to scrape out the zucchini flesh (see recipe note), chop it and set it aside. 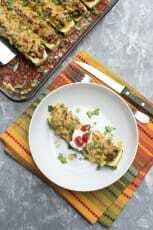 Place the scooped out zucchini boats into a 13" x 9" baking dish and add about 1" of water. Cover with foil and bake in preheated oven for 20 minutes, until just slightly fork-tender. Remove from oven, and set aside to cool slightly. Meanwhile, add olive oil to a 12" skillet and place over MEDIUM heat. Add turkey (or beef), onion, bell pepper, and garlic to the skillet. Cook, stirring to break up the ground meat as it cooks. Continue to cook and stir until meat is thoroughly cooked and veggies have softened. Drain off as much grease as possible and return the skillet to the heat. Add the chopped zucchini flesh, mushrooms, remaining marinara in jar (reserve 1 cup for later), parsley, Italian seasoning, salt, fresh ground black pepper, and crushed red pepper. Stir well to combine. Bring to a simmer, then reduce heat and allow to simmer over low heat for about 15 minutes. Remove partially cooked zucchini from baking dish and pour off water. 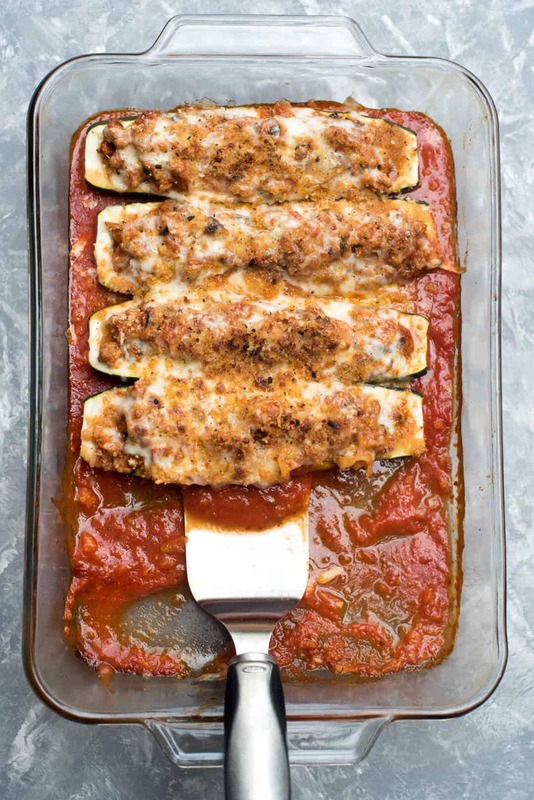 Pour the 1 cup of reserved marinara sauce into the empty baking dish and place zucchini boats on top of the sauce. Divide the filling between the zucchini boats. 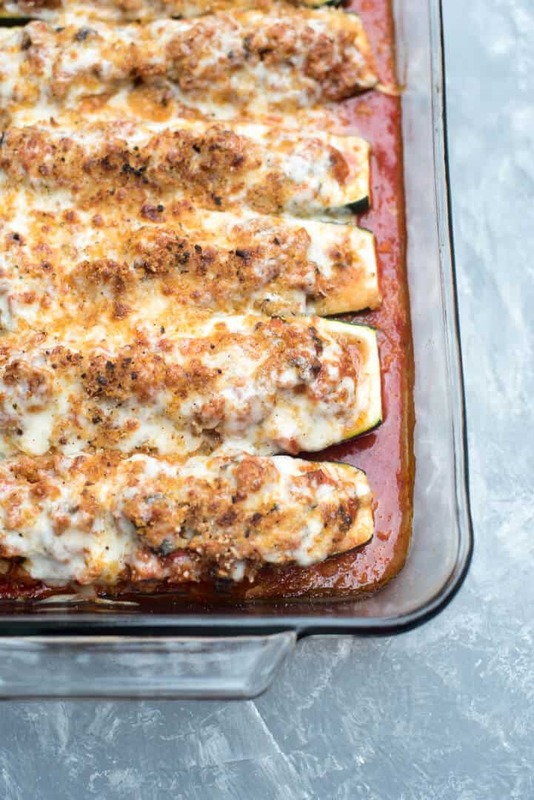 If you have extra filling, spoon it into the dish around the zucchini boats. Cover the dish with foil, and bake for 20 minutes, or until zucchini is fork tender. Remove dish from oven and set oven to BROIL. Remove foil and sprinkle zucchini boats with mozzarella, Parmesan and the panko bread crumbs. Place dish in oven, watching closely, and cook for just a couple of minutes until cheese has melted and bread crumbs are golden brown. My tip for scraping out zucchini flesh. Use a sharp knife to lightly score the zucchini to outline the area you want to scoop out being very careful not to cut through. You just want an outline. Use the tip of a spoon to scrape the flesh out and on to a cutting board. healthy and tasty! thanks for the recipe! gotta try it! Can you provide the nutritional value? I need it for a program I am doing. Thank u! I don’t provide nutritional information at this time, Aimee. There are a variety of nutritional calculators available online. You should be able to locate one with a quick Google search. I haven’t tried freezing them but if I did, I’d be inclined to portion out and freeze the filling by itself. That way you could use fresh zucchini and just the amount of filling you need for a meal. Why on Earth would you freeze it before cooking? You should cook it and then freeze it and then to reheat simply microwave. Due to popular demand, I have updated this recipe to include the nutritional information! The recipe makes a total of 6 servings – 1 zucchini boat per serving. Oops. I guess I thought I was three people. They were so good! This recipe was amazing – so tasty! Thanks! Can these be frozen? I am single and could not eat all up before they go bad. Thanks! I have frozen my stuffed zucchini & yellow squash boats. They reheat just fine. Almost as good as when frehsly made. I’ve frozen and they reheat perfect!! Why wouldn’t they be? It’s just cooked meat and vegetables. Cook them let them cool then portion them into freezer bags and freeze. To reheat just microwave on high for a few minutes. Wow that some people are so helpless about cooking! Some high water content vegetables, like zucchini, might not fare that well after freezing and defrosting so I think it’s a very valid question. My preference would be to use fresh zucchini but I totally get the convenience of frozen food. No need to shame people for asking a common question. Not everything freezes well. Why the rudeness, people ask because they don’t know. Loved it! Thanks! My only problem with it is that the recipe isn’t easily printed. All the recipes on my site are printable, Michelle. Just look for the “Print” icon just below the photo on the recipe card. If you are using an iPad you need to click on the 3 dots next to the forward arrow in the top right corner of the screen and scroll down to “Open in Safari”. After you open in Safari – if you click on the word print it will work. Do you eat the whole Zucchini or just the stuffing? Turkey is real food and won’t clog your arteries like ground beef – not to mention pink slime and a host of other problems. Some of us can’t eat red meat due to ditary problems. These were EXCELLENT! Used lean ground beef. This looks wonderful. Can it be frozen? If were to freeze this recipe I’d be inclined to just freeze the meat mixture and then scrape out fresh zucchini for filling when ready to bake. Substituted the Turkey for Italian Sausage. Yummmmm. This was simply delicious, the hubby and I ate every last bit of it. I made it with ground beef rather than turkey. Will definitely make again. Thanks so much, Julie! I miss you too, girl! Any nutritional info on this? Hi Chana. The rice side dish is not so much a recipe but does involve a trick I’ve used for years. You can use any boxed rice mix you like. I believe the one pictured here is a wild rice mix. Prepare as directed with the included seasoning packet but add an additional cup of water and 1/2 cup of plain rice – white or brown – and proceed with the recipe as directed on the box. I started doing this years ago to stretch one box of rice to feed a family of 6 but the other great aspect of this is that it reduces the sodium content. Just food for thought…it takes the same amount of time to “just cook your “own rice(white or wild) and you don’t have all the sodium” that is in any seasoned mix that is boxed . While “rice is simmering, I’ll add chopped onion” to the rice and whatever seasoning I might have in mind.Cheaper too:)…Especially since you are “adding extra rice to the packed rice mix anyway. It is included on the recipe card. I am also looking for the nutrition information. I have clicked print for the recipe card, but I don’t see it on there. I have looked everywhere on this site but still not seeing it. I made these and they are delicious! Thanks for sharing!! The nutrition information is on the recipe card below the instructions. If you still don’t see it, please let me know what browser you are using so I can investigate further. Thanks! I didn’t see nutrition info either, I’m reading on my cell phone, I figured that was the culprit. Thanks so much, Jaime! It must be an issue with mobile. I’ve got some smart people looking at this and it should be corrected very soon. Can you give me the calorie count per serving? Much much much, did I say much better then we imagined, probably due to my sauce ? but an amazing dish nevertheless !!! Tks Val ? If you made your own sauce then I am very sure it was spectacular. Thanks so much, Guy! This is the best “new” recipe I have found in a long time it was wonderful. I froze half of it and it was fine later! ucan you use summer squash instead of zucchini for this. I suppose you could but watch it close during the initial baking time. I think summer squash is a bit more tender than zucchini and may not need as much time to soften. When you scoop out the flesh, do you remove the seeds before you chop it? This sounds delicious, and I’m definitely going to try it! Hi Judie. No, I don’t scoop out the seeds. Just give it a rough chop and you’re good to go. I hope you love it! Thanks!! I’m sure I will! Yum!! These were the best!! Even my picky husband loved them. Will definitely be making these again. Thanks for the great recipe, Valerie! This recipe is delicious. I added some baby spinach and chicago steak seasoning (because i used turkey). Also i tossed the breadcrumbs with alittle melted butter. Added marsala wine to the sauce. AMAZING!!!!! DELICIOUS! Terrific recipe. My 9 year old wanted it for her birthday dinner as she loved it during regular meal time. TIP: Do NOT over-cook….as I did the second time. Nobody likes mushy zucchini 🙁 My fault, not the recipe…but I do have to figure out what the right temp/time for MY oven is! I’ve been thrilled to hear how much kids are enjoying this recipe. And, yes, you really need to watch that zucchini on the first bake to be sure it gets just slightly tender so it doesn’t go too far on the 2nd round in the oven. Thanks, Marie! 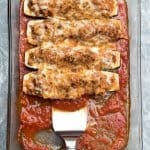 Has anyone tried making this without precooking the zucchini!? Wondered if you just stuffed and baked if it would turn out? Hubs and I added slices of pepperoni before the cheese and skipped the breadcrumbs sincecwere doing low carb. Added that extra Italian flavor Never seen a man polish off a veggie dish so fast !! We just finished a pan of this and it was SUPER!! Wife and kids loved it too. I did make a couple changes that kinda reflect our personal tastes though. We all hate turkey, so I ground chicken thigh fillets with a good handful of fresh basil leaves from the garden. I also tripled the garlic because, well, we love garlic! lol Seriously this is one awesome recipe to add to our many reasons to grow lots of zucchini every year. The only downside is I won’t have as much to make pickles with if I keep cooking it in recipes this good! Thank you Valerie! This is truly one for the books! Hi There! I had to “smile”, reading this, as “i too”, could never imagine life “without pasta”….Then, one day, having dinner with our friends, talking food at an Italian restrurant…Her husband just “blurted out”…Think about it, “pasta HAS NO FLAVOR…It’s “what you put ON IT”….I’m a real italian, my parents from Italy….But “it did “make sense”…So when I get the URGE , for that lovely tomato sauce, but trying to “cut down the carbs….I’ll either make this recipe or “sometimes “just pour the sauce over an egg and POUCH it! (medium well, a little running) Yum! YUM. I was trying to find more reasons to eat the gigantic squash that my garden has been producing and this was the perfect recipe. I have been leaving cheese out of my diet, but I couldn’t resist for this recipe and I’m SO glad I didn’t! The cheese topping was delicious. The only part of the recipe that I changed was that I replaced the mushrooms for olives, seeing as I’m not a mushroom person. Thanks for posting Valerie, I will definitely be using this recipe again. We’ve got tons of zucchini and other veggies in our garden. Just picked up some ground lamb and will be trying this tonight! I plan on cooking some quinoa and adding that to my filling, too. Thanks for the recipe! Yum! This is a wonderful recipe and so delicious! I make this when zucchini season is upon us. For an easier version, I use Hot Italian Sausage in place of the turkey thus eliminating some of the spices called for. Calorie/carb count? For goodness sake, unless you are pairing this with a double loaded cheeseburger and fries, it’s a great healthy meal! Or instead of the meat, use Stove Top stuffing. Trying this out for the first time tonight. I’m using ground turkey Italian sausage instead of just ground turkey and I’ll try, as suggested above, adding some melted butter to the bread crumbs! Can’t wait to try it! Delicious! I added a little more seasoning because it seemed a little bland. I omitted the bread crumbs and they still came out delicious! My family enjoyed them. This recipe is going in my recipe book. Thanks for sharing! The zucchini boats were delicious! I used lean ground turkey and added 2 cooked links spicy chicken sausage(out of casing) to the mix. I didn’t bake the zucchini prior either. I baked boats at 400 degrees for 20 minutes covered and 10 more minutes uncovered to make sure zucchini was cooked through and it worked perfectly! 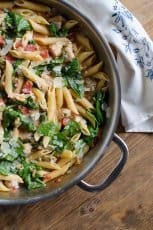 Could this dish be prepared ahead of time and refrigerated a few hours before baking it (adding some extra time to bake)? Thanks! Absolutely! I might advise that you take a minute or two off the first bake of the zucchini as they might soften a bit as they sit in the fridge with the filling but the dish reheats beautifully so I think advance prep would work just fine. Just wanted to thank you for your reply to my question. And I also wanted to let you know that I did prepare the recipe ahead, following your suggestions, and it turned out perfectly. It was delicious! Thanks for the great recipe! You are so welcome, Joyce! I love that you use turkey! Lots of people like me are allergic to beef. Wow, just ran into this recipe a few weeks ago, and am making it for the third time! Thank you! My modification was with scooping out the Zucchini. I prefer to scoop it out with a spoon, just after I cut it open. I use a soup spoon for the larger zucchini, and a serving spoon for the skinny ones. Works like a charm. Then I invert the Zucchini in the dish and cook it that way for the first 20 minutes. Thank you so much for the idea! Deliciousness to the max! Honestly, the best zucchini boats I have ever had. The first time we made these, my 5 year old grandson who “hates zucchini and mushrooms” pronounced these “vegetable boats” (as we called them) wonderful. We liked them so much we are having them for supper again tonight, Thank you for a great dish! That is adorable, Mary Jo! It warms my heart to hear how many little ones have been enjoying this dish. Thank you so much for your comment! This was the best zucchini ever! So yummy, my husband loved it too! I had leftover filling so I made more the next night it was that good! It is my new “lasagna” go to. Our Paleo eating friend loved them too! Great recipe, will not make any other recipe, as my husband said “why change a great thing”…..
@valerie … i made this, again, last night and, as usual, it was a spectacular hit .. this time i added some of the italian sausages costco sells — broke up two and added to the burger …. This was delicious. I used ground turkey and two Italian sausages, which I cooked down, along with fresh basil and parsley from my garden. The end result was fabulous. Thanks for sharing. This is our favorite zuccini recipe ever! I make it at least once a week and it is always delicious! My oven broke and I couldn’t bake for a month, the first thing I made when I got a new range was this! Delicious! Used ground beef because it was what I had, and it was fabulous! 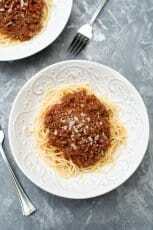 Trying to cut carbs but we love spaghetti, so I served it over 1 cup of spaghetti with plain sauce and it gave us our pasta fix, with the bonus of all the veggies and great flavor! Very filling, which was unexpected for my husband because he wanted to eat two but couldnt! I think the estimated time is way off. 20 minutes for the zucchini in the beginning, Brown the turkey then simmer for 15, fill the boats and cook for another 20, then melt the cheese… not to mention all of the vegetable prep work. This is closer to an hour or an hour and a half. I made these today. They are excellent! I used 99% lean ground turkey seasoned with the spices as stated in the recipe along with seasoning salt, garlic powder, & garlic salt (I used these last 2 seasonings because I didn’t have garlic). I also used a green pepper instead of a red pepper (only because the green pepper was less expensive). I ate them with white rice and green beans. These are delicious! I sent the recipe to all my friends. The calorie content says 310, is that for one? The serving size says, as served? Try Italian chicken sausage without the casings. It is healthier than ground beef and better flavor than ground turkey. We love it better. Omg! I stumbled upon this recipe and couldn’t be happier with it! It is so yummy and filling. Wow! Thank you for posting. This is a keeper for sure! This is a easy to follow, and simply delicious recipe! We made it last summer, and it is one of our all time favorites. Thank you for the wonderful recipe and intricate directions….if you have NOT tried this, do yourself a favor and make it tonight!!! Thanks for the great tip, Debbie. Hope you love them! Can you’ve do these on the grill? I’ve never tried grilling them, Gina, so I’m afraid I can’t say for sure how that would work out. This was awesome. Tripled the recipe for 4 adults and not one boat was left. Thank you for a great recipe. My 2 1/2 year old grandson loved it. I am always so thrilled to hear about little ones enjoying this recipe. Thanks so much, Angela! Thanks for sharing! I have made this countless times as is and it is so easy and and delicious. I now add a few chopped garlic cloves to the filling and if I have it, I like to sprinkle with fresh basil. YUM!!!!! 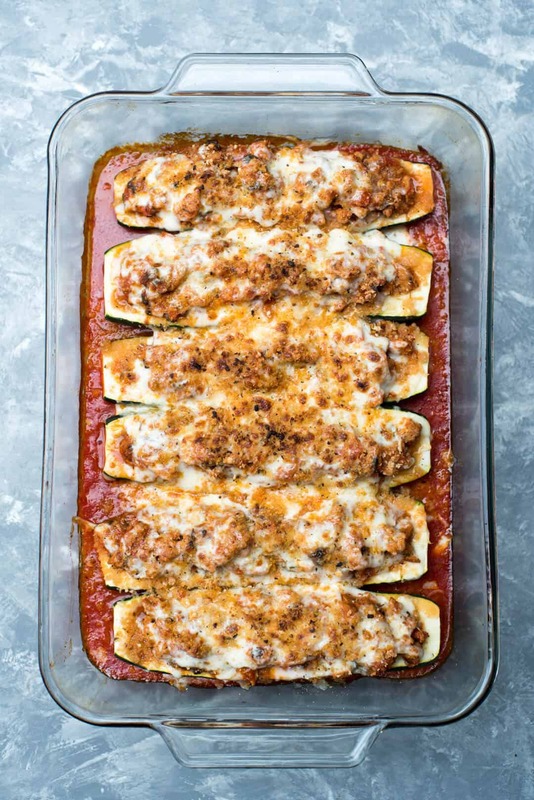 This is a great, healthy idea (until you add the jarred sauce..) I will make a version of this tonight using up extra zucchini, thanks for the idea! This was delicious, healthy and perfect for a cold winter night! Thank you Valerie for the recipe. I used ground lamb instead of Turkey. My family loved them alot! I made seasoned white rice as a side. Yummy! Could you substitute cheddar cheese for the mozerella or will it make it taste bad? You can substitute any cheese you’d like, Lexie, however I do think the mozzarella is the best choice when paired with pasta sauce.